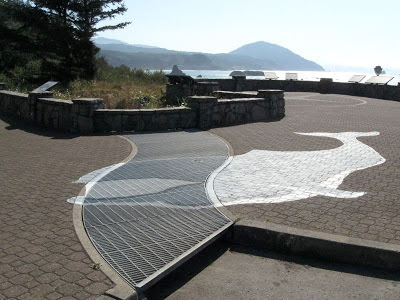 Port Orford wasn’t part of any planned itinerary for our drive south on Day 3 of our West Coast trip in October. 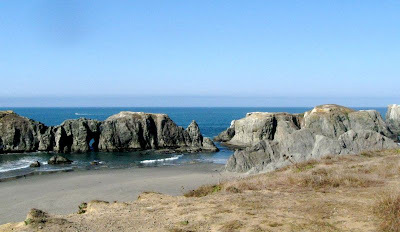 But it was an interesting section of Oregon’s southern coast. Our first stop in the area of the City of Port Orford was the port. 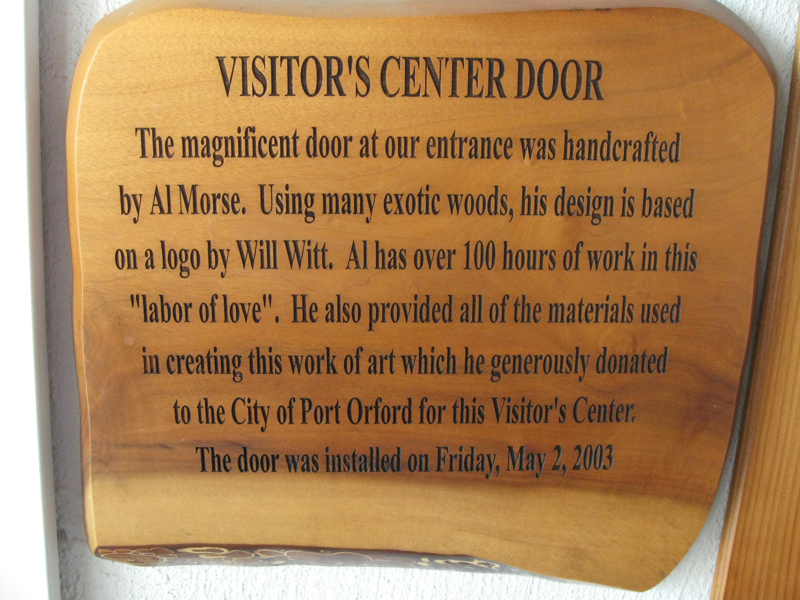 Perhaps the appeal was a port with “port” appearing twice in its name. 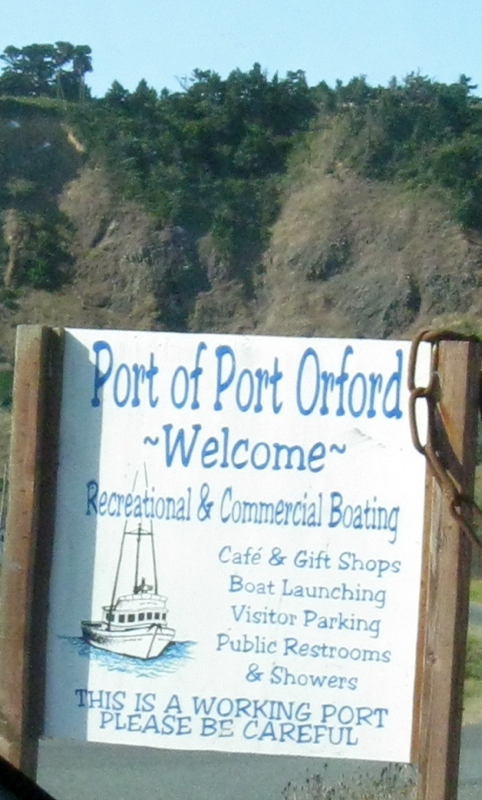 We made the turn that took us down the hill to the Port of Port Orford. The first curiosity I noticed was that there were no boats floating secure in a harbor such as we see in our northern Gulf of Mexico region. Instead a bunch of boats were lined up side by side, all on land. 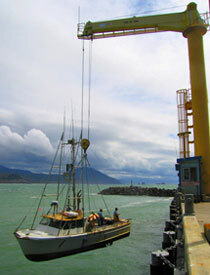 According to the port’s Web site, the port is a “dolly dock.” A huge crane plucks commercial fishing boats and recreational boats straight out of the Pacific and sets them down on custom boat trailers. The trailers can be moved around on the dock by pickup truck—one boat to one trailer. I borrowed the photo below from the port’s Web site. A little farther down the highway, we spotted the City of Port Orford Visitor’s Center. About 40 minutes earlier and 26 miles north, I had been shivering, in spite of my heavy jacket, while I took the photo below. Now after a bit of walking around outside at the visitor’s center I was shedding the jacket. Thanks to Wikipedia I later learned that the warmer temperatures were not an abrupt coastwide weather change. 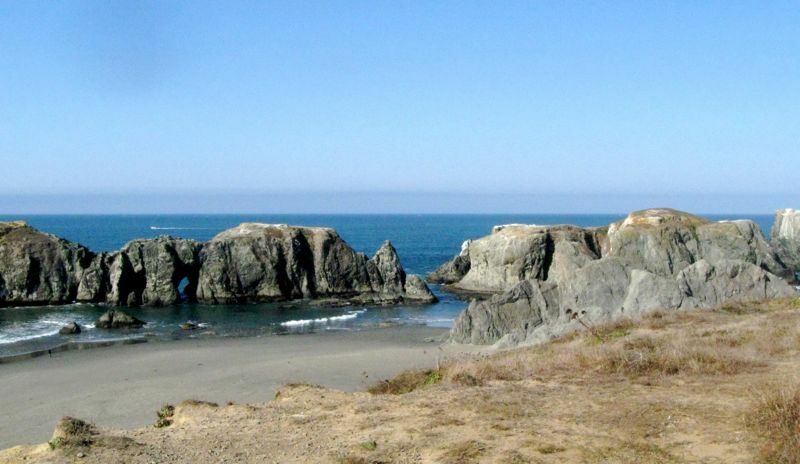 Port Orford is at the northern end of what coastal Oregonians call the Banana Belt, because the weather from Port Orford south is warmer than the weather north of nearby Cape Blanco, especially in the wintertime. The visitor center door above, open to the almost balmy breezes, was a testament to the pride that Port Orford residents have in their town. 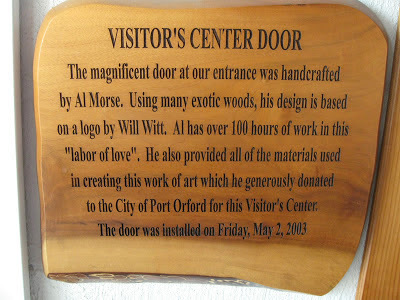 The artist who crafted the door donated both the exotic woods he used and his craftsmanship. The lady staffing the modest information center was a recent and happy transplant from Sacramento. She sparked twinges of envy in me. She worked with huge windows on two sides that gave her a spectacular view of the Pacific. My twinges intensified as she mentioned how much she enjoyed watching the whales, weather and sea birds. In my former professional life I worked with dynamic marine educators who were dedicated to spreading to individuals of all ages the knowledge of natural ocean and coastal environments, plants and animals. And they had a passion for preserving those environments. 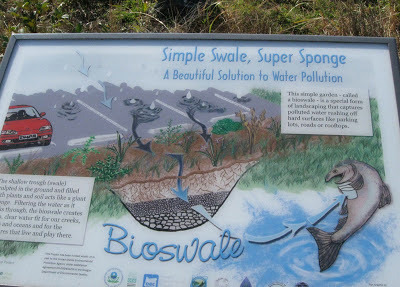 They would have approved the “bioswale” that absorbed the water from the drain and naturally filtered it. They would also have appreciated the colorfully presented information explaining how the bioswale works. As I worked on this post I realized we never did visit the Port Orford town center. Maybe next time. The door is beautiful! And I especially like the third picture! The crane mystifies me. Wonder why they can't just let the boats come in themselves whenever they want? Very interesting post. You learned a lot about this port. 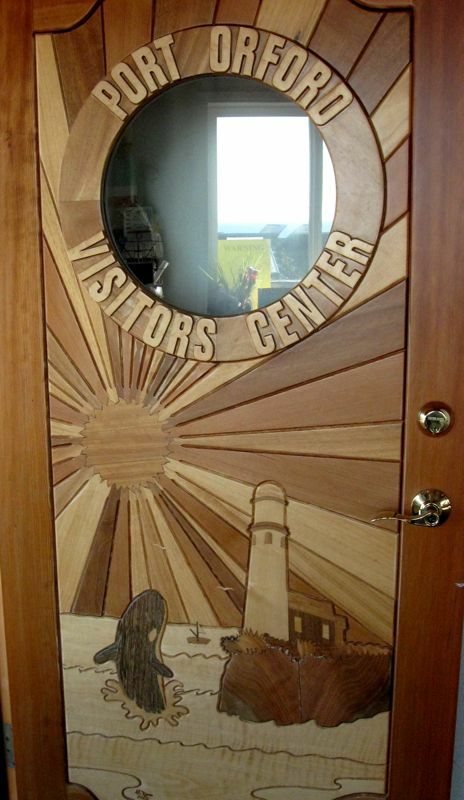 that visitor center is worth visiting all by itself. love that door... i get twinges of envy sometimes when i see places or things i can't do... more great photos from your point and shoot.